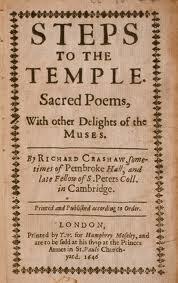 Richard Crashaw (c.1613—1649) was greatly inspired by the posthumous publication of The Temple (1633) by George Herbert. He is, however, often not included in lists of the metaphysical poets, because of the influences of Italian and Spanish mystics and of continental poets on his verse. Although Crashaw's father, the Puritan divine William Crashaw, was opposed to the Catholic church, his personal library contained many volumes by Catholic writers. Some feel this was for the purpose of exposing their errors; he translated, however, several Jesuit hymns from the Latin, so he seems to have appreciated their devotion. Well after his father's death, when he had travelled to Paris to avoid the conflict of the Civil War, Richard Crashaw officially embraced Catholicism. Still may behold, though still I die. So gainful is such loss of breath.